New Delhi: US plane maker Boeing Co.’s worker union strike last month is expected to further delay deliveries of 787 Dreamliner jets to National Aviation Co. of India Ltd-run Air India from late 2009 to 2010, which could affect its planned route launches. This would be the fourth time the aircraft’s delivery schedule to Air India may have to be reshuffled. The first delivery of the aircraft was expected in 2008, which was pushed back to early this year and then to October. The ‘Wall Street Journal’ reported on Thursday that Boeing might push back the first deliveries of the Dreamliner by at least six more months. “It has not caught us unawares. We are kept posted of the schedule with regards to the developments of the aircraft by Boeing," said Air India’s executive director Jitender Bhargava. “Some delay is not unusual, as these new aircraft have a long development cycle and a complex global supply chain. If there are persistent delays, then the collective impact on the manufacturer is far greater then the individual impact on a carrier. 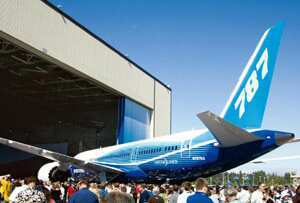 All put together, for Boeing it is a reputational setback and it will have financial consequences." said Kapil Arora, an aviation analyst with audit and consulting firm Ernst and Young. Boeing’s vice-president, sales (commercial airplane), Dinesh A. Keskar, who met Air India officials on Friday, said the firm was assessing the extent of the delay. It has roughly 900 orders for Dreamliners, the first of which was to fly with Japan’s All Nippon Airways mid-next year.